Tomorrow’s Kin is the first in a new sci-fi series by Nancy Kress. It opens with a mystery, of sorts – an alien spaceship sat at anchor near the United Nations. But there’s more than first contact at stake. The world as we know it has changed. Well, a little, anyway. 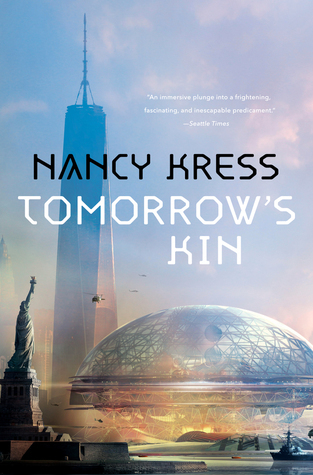 At the start of Tomorrow’s Kin, the social geography feels familiar. New York is still New York – a thriving city of millions, going about its business in a way that the reader is broadly acquainted with. Kress does show us snippets of urban life – there are quiet moments in city parks, and brash, gritty diners. These are contrasted neatly with the quieter, more remote rural areas. Again, this feels like the calm before the storm – the world is one we recognise instantly, and the concerns are similar, if sometimes a little esoteric – damage to the environment, debates over immigration and sovereignty, economic downturns, and who’s going to win the Superbowl. It’s all mostly in the background, but this is our world, the lives we live, and in that context, it’s very convincing. Of course, in this case, there’s also aliens. Quite what they’re up to, why they’ll only talk to the United Nations, and even what they look like – it’s all something of a mystery. I was reminded of Clarke’s Childhood’s End; the aura of mystery and creeping concern is similar. But these aliens – whatever they may be – are a catalyst for exploring larger ideas. The text follows one family, that of Dr. Marianne Jenner. Jenner is brought to speak with the aliens after making an unusual genetic discovery – and everything unravels thereafter. Marianne herself is an interesting protagonist – a sharp, smart professional, who is self-aware enough to be confident in her competence but not feel egotistically brilliant. Her two drivers appear to be professional progress, and, perhaps more importantly, her family. She’s convincing as the logical, perhaps slightly frosty scientist; but her internal monologue gives her a vulnerability in thoughts of her family which is equally substantial. That family is multi-generational – children and grand children – and more than a little troubled. A daughter is a forceful immigration agent, given room to discuss immigration, the economy, and other bête noir. This usually leads to a clash with one of Marianne’s sons – an ecologist, concerned with invasive plant species, rather than with the movement of people. They’re both given the room to be opinionated, their arguments crashing together between the pages. This isn’t a political tract, mind you – but the discussions are engaging, and help indicate both the personalities of the characters, and the state of the world around them (or at least, those parts of it which they’re concerned with). Marianne does have another son, Noah – a wanderer, a wastrel, a man who feels the need to take drugs in an effort to define an identity for himself, lost in the shadow of his siblings. This is a book which tries to meld the drama of one family – their smaller squabbles and relationships and concerns – into the larger narrative themes it’s wielding. It actually works rather well, letting the broader themes be illustrated in the effects on individual lives. As the story hots up, the focus draws tighter around Marianne, tracking her through decades of discovery, and charting her family and world at the same time. It’s surprisingly difficult to talk about Tomorrow’s Kin without spoilers, as you can probably tell from the above. But it pulls together some excellent science-fiction threads: it has a big idea, and it follows that idea to a logical conclusion. The story approaches its concepts logically and plausibly – and the trials and tribulations of the characters work, both because they make sense in context, and because we’re drawn into caring about the characters. Alongside the big idea (or two), there’s a multigenerational family story, one with arcs of personal discovery to match the science happening elsewhere on the page, and with the ability to relate facets of larger debates into a smaller scale, convincingly and in such a way as to make for an interesting read. It’s not perfect – it feels in some cases that the conceptual stuff, the clever ideas, the “sci-fi” bit, if you like, takes up the page at the expense of further depth of character, especially for some of Marianne’s family. This isn’t an entirely bad thing – the concepts on display are cool, and a lot of fun to read. I guess what I really wanted was a little more; we can care for Marianne, and sympathise with her tribulations, but it feels like there’s room here to tell more stories about her family, and give them a little more room to breathe. That said, this is an undertaking of impressive scope – a mixture of multigenerational saga and hard science fiction, across geography and time periods, able to talk around some of the big issues of the day, and throw its own ideas into the mix. On those terms, it’s also a successful one – I kept turning pages to see where the story would take me next, and the ambitious and compelling narrative held up to the end. If you’re looking for a solid piece of hard SF, this looks like the start of an exciting new series.